Wonderful Japanese Vintage Silk Kimono with silk Obi. Comes with Tatami Mat shoes and Tabi Socks (We only have size 8.5-11 in women's shoes and socks in stock. 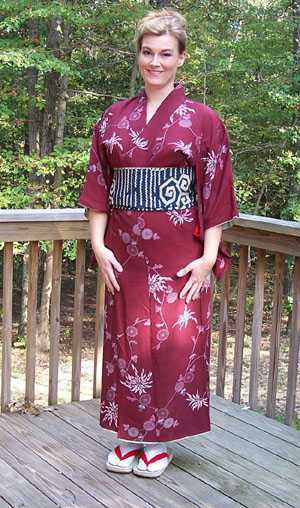 This Kimono fits up to woman's size 10 USA. It is a beautiful antique silk with a lovely hand-stenciled pattern of flowers.